Young people have had a hard time during the aftermath of the financial crisis of 2008. Youth unemployment spiked and has only recently started coming down again. But the headline of unemployment hid other, longer-standing challenges facing young people in their efforts to find a job. Over recent decades it has taken young people longer to find secure work, and more and more of them have typically experienced periods of instability moving in and out of low-hours, low-paid jobs, or cycling between “low pay and no pay”. As a result, young workers are far less likely to be members of unions. In response, the Trades Union Congress (TUC) and its member unions have been working on a strategy to campaign around issues of interest to young people both in their work and with wider issues such as housing. They are due to report their progress so far to their annual conference in Brighton this week. The mechanisms that previously helped young people find decent jobs have gradually been breaking down. The provision and quality of careers guidance is patchy and advice provided to unemployed young people is driven by a culture of targets for job applications, no matter whether the jobs applied for offer appropriate opportunities for training and development. Politicians have trumpeted apprenticeships as a way to address these acknowledged problems, but time and time again, evaluations show that although some offer good quality training and a route to a career path, this is by no means always true. As a result, young workers are increasingly finding themselves in low-skilled, low-paid and insecure work. They form a large part of the workforce in sectors such as hospitality, catering and retail where this kind of precarious work is common. These occupations have long been the areas where many young people find their first jobs. But in the past there have been routes into management career paths in those sectors, or into jobs requiring higher skills and pay. Those “ladders” have been gradually dismantled because of the way the career structures have changed. Young people are increasingly expected to navigate complicated labour markets, moving between employers, rather than progressing gradually up an established career ladder. Some of the exploitative practices that have long been common in sectors such as the creative industries have also spread into new areas including professional work such as banking and law. It has become increasingly common for young people to have to undertake low-paid – or sometimes unpaid – internships to gain work experience before landing their first jobs. The Social Mobility and Child Poverty Commission recently highlighted how divisive this is as young people from wealthier backgrounds are able to afford to develop these opportunities while less advantaged young people are locked out because they are unable to afford to support themselves during these placements. Unsurprisingly, trade unions in the UK and elsewhere have become increasingly concerned about these developments and have started to explore what they might do to help young people fight for more and better jobs. 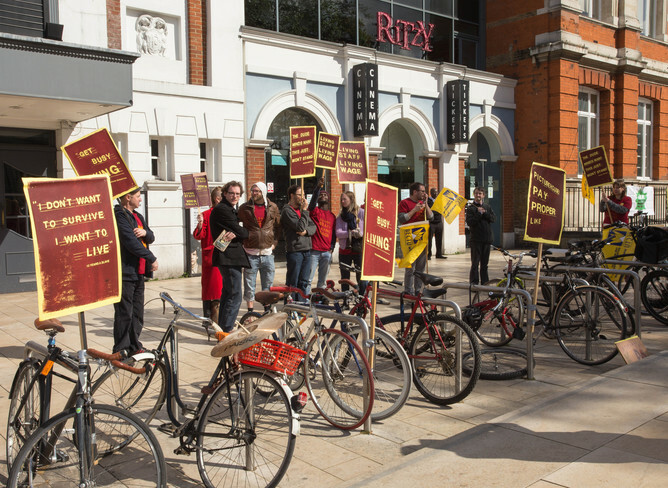 Developing from campaigns like that run by the Broadcasting, Entertainment, Cinematograph and Theatre Union (BECTU) at Ritzy Cinemas in Brixton, the TUC has developed a strategy to support young workers and help them organise against unpaid work, zero-hours contracts, and many of the most extreme forms of exploitation they face. At its annual Congress, the TUC will hear examples of the kinds of campaigns run by individual unions. Innovative examples include work done by unions and community groups to promote the Living Wage in London and beyond. Another example is work done by the Community union to regulate the quality of apprenticeship training by providing the training provision themselves. The public sector unions have pushed to ensure agreements with employers about the quality of apprenticeships and have helped focus attention on the job opportunities available to apprentices once they have finished their training. In the entertainment sector, BECTU and the Musicians Union are working hard to ensure that young people don’t feel pressured into working for free. These are all really important initiatives in workplaces where unions have representation rights; however, many of the employers in sectors where young people face the worst working conditions do not bargain collectively. For that reason, unions around the world are uniting to put pressure on fast-food employers to pay decent wages with good working conditions. In the US the Fight for $15 has brought low-wage workers on to the streets in large numbers. Even the traditionally well-organised unions in the Nordic countries are increasingly concerned about the challenges of representing young workers in these jobs. A new research project I’m involved with, funded by the Hans-Böckler Institute in Germany, is bringing together researchers from the UK together with teams in the US, Germany, France and the Netherlands to compare union initiatives and these developments across countries and sectors. Our aim is to explore what makes for successful campaigning and bargaining to help improve young people’s working conditions and help them overcome the barriers and challenges they face as they enter the world of work.